Global stock markets delivered robust gains once again in the fourth quarter, capping off a stellar 2017. In the U.S., the S&P 500 rose every month of the calendar year for the first time ever. Emerging Market stocks led the way during the quarter with MSCI Emerging Markets up 6.8%, while the S&P 500 rose 6.6% and non-U.S. developed markets, as measured by MSCI World Ex US, were up 4.2%. While hundreds of factors influence stock market returns, two topics emerged in Q4 which were notable. The first being continued, solid economic growth around the world. All 45 countries tracked by the Organization for Economic Cooperation and Development (OECD) were projected to grow in 2017, the first time since 2007. Secondly, the long-anticipated Tax Cuts and Jobs Act was passed at the end of the year, featuring the permanent reduction in the corporate tax rate from 35% to 21%. Temporary reduction of rates on the individual side were also noteworthy with some changes being made to limit individual deductions, particularly for individuals living in expensive housing markets, or high-tax states. Many market participants expect companies to use those savings in the form of share buybacks or increased dividends; however, it’s impossible to know to what degree those future actions are priced in already. In December, the Federal Reserve increased the target range for the federal funds rate to 1.25-1.50%, the third hike of the year. With new Fed Chairman Jerome Powell set to take over for Janet Yellen in early 2018, markets are predicting an additional three Fed rate hikes in 2018. 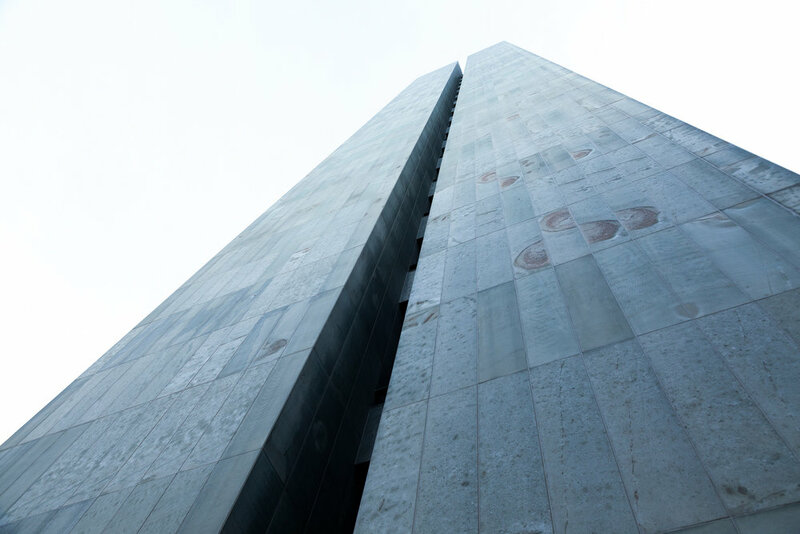 Seemingly reacting to these rate hikes, but not anticipating faster overall economic growth, interest rates rose more on the short end of the curve than on the long end in the fourth quarter. The 2-Year Treasury rose 42 basis points to 1.89%, while the 10-Year Treasury advanced just 7 basis points to end at 2.40%. The ending yield on the 10-Year was down 5 basis points from the end of 2016, reflecting a flattening yield curve. The U.S. Dollar Index, a measure of the value of the United States dollar relative to a basket of foreign currencies, fell again in the fourth quarter — with the U.S. dollar depreciating by 0.7% compared to foreign currencies. For the year, the U.S. dollar weakened by 8.6%, thus increasing the value of international holdings. Domestic economic data continued to plug along at a healthy pace. Third quarter GDP increased at a 3.2% annual rate helped by exports, government spending, and private inventory investment. The unemployment rate in December came in at 4.1%, a decline from 4.2% at the end of Q3. Despite the unemployment rate at or below 5% for the last two years, wage growth has been relatively tepid, ticking up to just 3.2% over the last year to November. The Fed’s preferred gauge of overall inflation, the core Personal Consumption Expenditures (PCE) index has ticked up slightly over the last quarter but remains low at 1.8% in November from the prior year. U.S. stock indexes rose to new highs while volatility all but vanished from the stock markets. International stocks in the Developed Value and Small areas, as well as Emerging Markets, also saw robust gains. Bond yields moved more at the shorter end of the curve, with longer exposures like the Barclays U.S. Aggregate Bond Index seeing marginal gains of 0.39% for the quarter. 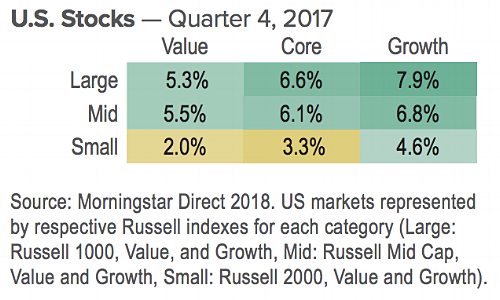 In the U.S., Growth stocks led the way in performance during Q4. Large Value stocks were positive, though trailing their Large Growth counterparts. Small stocks trailed across the board, with the Small Core segment underperforming Large Core by 3.3%. This mimicked the overall performance for the year as a whole — namely all U.S. stocks doing well, but U.S. Large Growth leading the way. Internationally, returns were strong across the board, with Small Growth leading the way at 6.4% for the quarter. Small companies outperformed across the Value to Growth spectrum, while Value trailed its Growth counterparts across the size spectrums. This also mimicked performance for the calendar year 2017. More aggressive models saw greater performance than more conservative models because of the higher returns in stocks compared to bonds. A diversified index mix of 65% stocks and 35% bonds would have returned 3.4% during the fourth quarter, nearly identical to the third quarter.